The Assisitve Technology Industry Association has their annual conference every January in Orlando, FL. Following are some of the new and innovative products I saw at the conference. 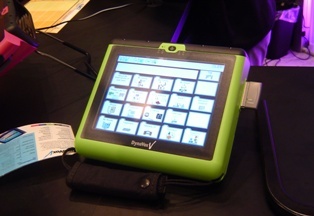 Dynavox has released their latest edition, which includes full access to Windows XP, wireless internet, access to office programs, and bright new colors. Visit the Dynavox website for more information. 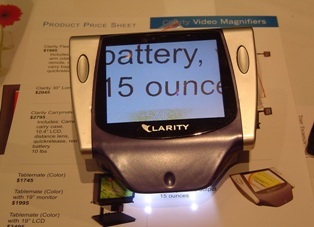 This small handheld video magnifier from Clarity has a slightly different design from other products of similar size. 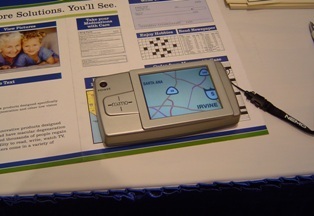 When in reading position, the screen is angled toward the user. Very simple and basic controls, includes the power on/off button on left side of screen, color mode button on right side of screen, and brightness control wheel on top edge above screen. Adequate room to write under camera when unit is flat on paper. Expected to cost around $695. New battery powered version of the deskmate. Uses a 17" LCD display and lithium ion battery. Unit expected to operate off battery for up to 4 hours. 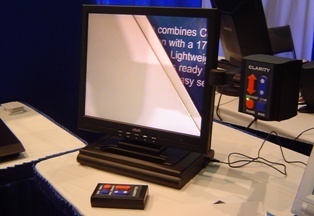 Also includes a remote control, and the ability to view both papers close up and the camera can be tilted for distance viewing. Screen will fold flat against the battery for make it easier to transport. Weights about 15 pounds. 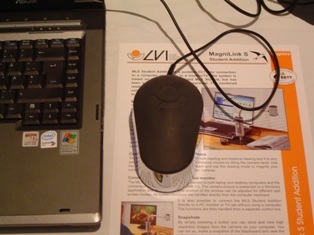 This Magnilink product from LVI is the size of a large computer mouse. It has been out a year or two, but for some reason I hadn't noticed it before. It plugs into a laptop USB port and displays the image on the screen. New handheld video magnifer from Enhanced Vision. Smaller than the Amigo, it will fit in your pocket. 4.5" LCD Screen, up to 9x magnification, 6 color modes, and 3 hour battery life.